We wanted to share this product with everyone because we recently had a chance to sample it and we really enjoyed the taste. If you enjoy the ice tea and lemonade combo, but sometimes wish it had a little ‘kick’ then this is definitely a product worth trying. NEW ULTRA 19TH HOLE LIGHT TEA & LEMONADE HITS SHELVES Refreshing Light Iced Tea and Lemonade Flavored-Alcohol Beverage from Anheuser-Busch Now Widely Available in the U.S.
ST. LOUIS, April 2, 2012 – Just in time for summer, Michelob ULTRA – the superior light beer – today introduced ULTRA 19th Hole Light Tea & Lemonade, an iced tea and lemonade-flavored alcohol beverage inspired by the golf course classic. Available nationwide for a limited time, ULTRA 19th Hole is a lighter alternative to traditional flavored malt beverages that is perfectly suited for an afternoon pool side or after a round of golf. 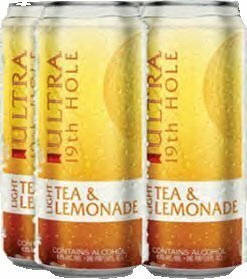 ULTRA 19th Hole is the latest innovation in the growing lineup for Michelob ULTRA, a brand known for brewing quality beers that appeal to active-lifestyle consumers. ULTRA 19th Hole is available in single-serve and four-packs of 16-ounce cans and can be purchased at convenience stores, select golf courses, and bars and restaurants. ULTRA 19th Hole is brewed at Anheuser-Busch’s Baldwinsville, New York brewery. For more information, visit www.MichelobULTRA.com or www.Facebook.com/MichelobULTRA (must be 21 years of age). Hmmm….very interesting. I am not a beer guy but typically like the vodka spiked tea / lemonade. Need to give these a try, next week perhaps?!?! I’m with Cookie…love the vodka + 1/2 and 1/2 but will surely give this a try. Now that sounds very interesting and would be very refreshing after a round. I am definitely going to give it a try! Arnold palmers are great on a hot day. Now you add a kick, sweet. Looking forward to sampling these someday soon.